Finally, after spring break, mother’s day and life in general, we’ve resumed cooking classes paired with books for little Miss I and her friend Z. This past week we decided to read from one of Little Miss I’s favorites to pair up with a recipe, so we pulled out of the bookcase Fancy Nancy and the Delectable Cupcakes (as Fancy Nancy would say, delectable is a fancy word for very yummy!). 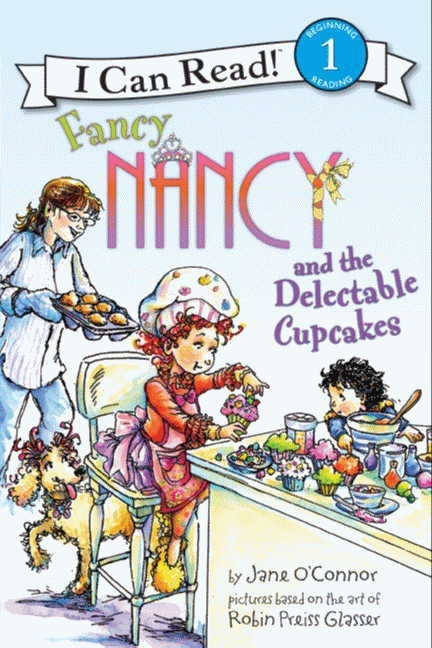 As with all of the other Fancy Nancy books, we love the “Delectable cupcakes” story and the way the series helps expand my little one’s vocabulary. Fancy Nancy is a very girly girl who loves frills, French and all things fantastic. The book is about how important it is to actually listen to other people, all revolving around baking cupcakes for Nancy’s school’s bake sale. In a very kid friendly way, the story shows what can happen when you don’t pay attention to what other people are saying. If you don’t know Fancy Nancy, I recommend this Level 1 reader series for any girl who loves girly stuff (and for any mom who’s tired of princesses and wants some sort of variety). As for the recipe, Kathleen’s chocolate devil’s food cupcakes is my absolute-hands-down very favorite starting point. The cake turns out moist and not too sweet, dark and wonderful. It started from “The New Basics cookbook” by Julee Rosso and Sheila Lukins, with a couple of tweaks. I’ve used this recipe several times as a base for many other things, red velvet and black forest cakes included. They say the original recipe comes from the Kathleen King’s bake shop in Southampton, NY. The most moist and soft chocolate cake, which can also be used as a base for other cakes that require a chocolate base. Preheat oven to 375ºF. Line two dozen cupcake pans with liners. Cut the chocolate in little pieces and melt in a bain marie, taking it from the heat as soon as it is done, so you don't scorch the chocolate. Set it aside. With an electric mixer, cream the butter and the brown sugar together until it is a little fluffy. Then, with the mixer in a lower speed, add the eggs, one by one. Once it is all incorporated, add the melted chocolate. Combine the baking soda, flour and salt. If using all purpose flour, also combine the corn starch and sift all of it together. Alternating with the buttermilk, add the flour to the chocolate mixture in three stages, ending with the flour. Slowly stir in the boiling water and vanilla. Pour the batter on the prepared cupcake tins, making sure not to fill them too much -- 2/3 of the cup is more than enough, or the cupcake tops will overflow instead of rising. Bake until a toothpick in the center comes out clean, about 20 minutes in the center of the oven. Remove the pans and let them sit for 5 minutes, before taking the cupcakes off onto a cooling rack. 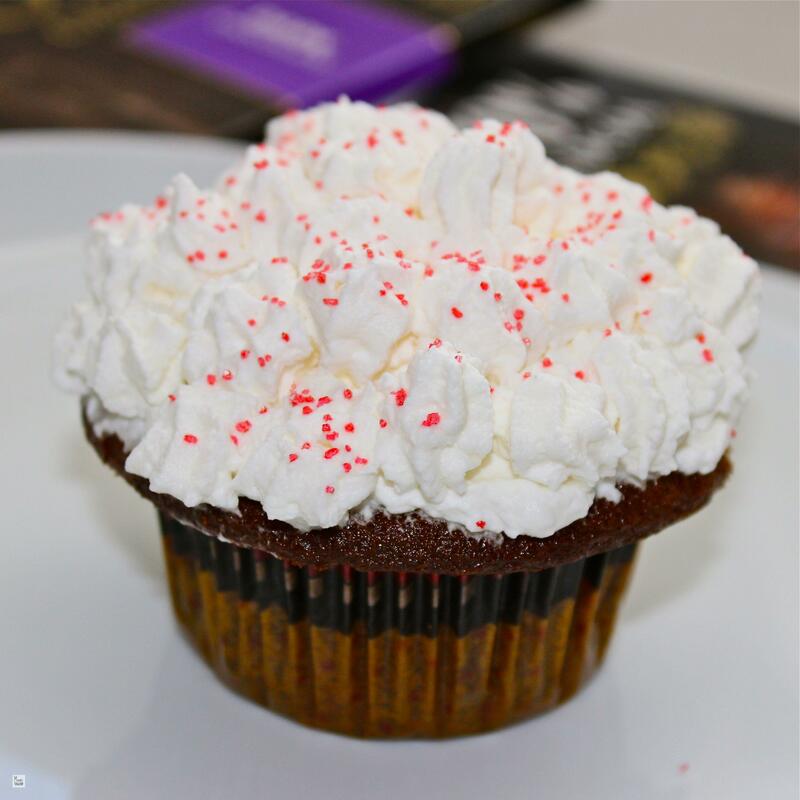 While the cupcakes cool off, you can whip the heavy cream with an electric mixer on high speed, until it starts forming soft peaks. Add the sugar and vanilla, and whip some more. Finally, add the tsp of Cream of Tartar, so that the whipped cream does not weep. Once the cupcakes are cool enough to handle, cover the tops with whipped cream using a pastry bag. Then you can decorate with sprinkles, fruits or candies. Enjoy! Once you decorate with the whipped cream, consume within the next few hours, or refrigerate. It is best to just decorate with the whipped cream the amount of cupcakes that will be consumed, as if you don't put the cream, they can keep up to 3 days in a closed container at room temperature. Whipped cream frosting, yum. Although I cannot consume whipped cream, I have no doubt that my husband would just love it on a cupcake. Romina, you can eat them without frosting… that’s the way my husband likes them!